The first thing you notice about Paul's work is the attention to detail. He creates all the wood parts himself, by hand. With gorgeous tops, beautiful nitrocellulose finishes and stunning designs these are some of the best looking boutique guitars I've seen. 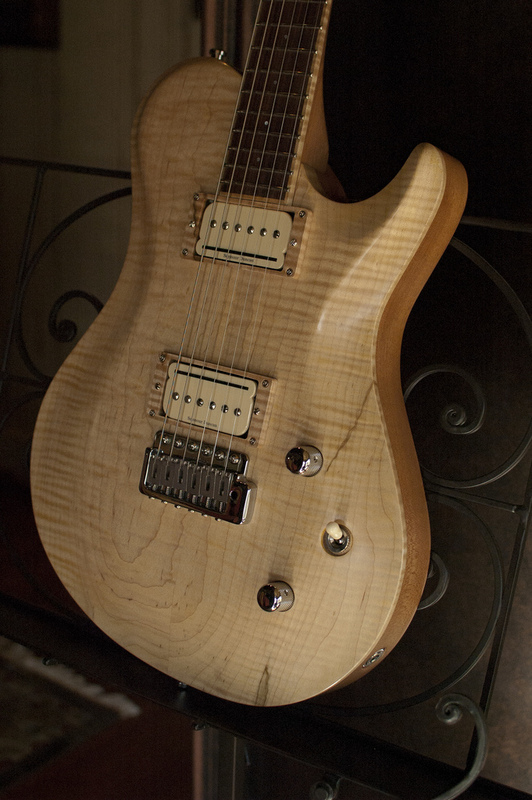 One of my favorite models is the 629 Doublecut, which is a PRS-like shape with a more aggressive carve in the top and a much thicker overall body profile. It's a beautiful design with a great feel. While Robbie was down in the studio playing some tasty licks on the new L'Esperance T-Series, I sat down with Paul to ask him a few questions. Ryan: The new L'Esperance T-Series seems to be a departure from your normal line of guitars since it is a basic Tele shape with Tele headstock. You seem to prefer to do original designs, right? Paul: Yeah, Robbie really wanted a traditional shape and I was happy to do it for him, but what really excites me about building guitars is coming up with original designs. It is important for me to design something different… to find that right shape and go for something no one else is doing. A lot of people enjoy playing a shape that is new and unique. Ryan: How did you get started building instruments? Ryan: What do you like the most about building custom guitars? Paul: I think the friendship that develops between me and my customers is my favorite part of the whole process. All of my sales up to this point have been word of mouth… these guys hear about me, we chat and plan out the build and due to the time it takes to create a guitar you really get to know a person. I have found a friend in each and every customer I've built a guitar for. 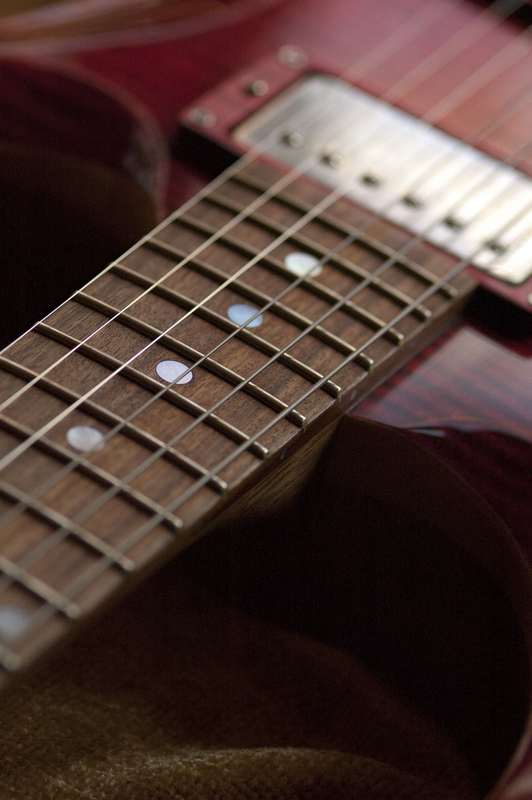 Ryan: What makes a custom-built guitar worth the price? Paul: I was building a guitar recently for a local guy and asked him to come down to the shop to see the stain that I had applied to the top. He really loved it, and while he was there I put the neck of the guitar, that I had just shaped, in his hands and asked him what he thought. He wanted a little more shaved off the profile, so right there I just did it and we got it to exactly the right shape and profile for him. You just can't get that in a music store. What you get off the shelf is what you get. Paul: My guitars have a limited lifetime warranty, which means I will fix anything wrong with that guitar for the life of the instrument provided that the customer hasn't abused the instrument excessively. My primary goal is to create a guitar that plays perfectly and performs like a professional tool should with minimal need for maintenance. I always build my stuff right from the beginning… then I focus on making them beautiful. Ryan: Thank you for your time and for letting me play your beautiful guitars! Paul: It was my pleasure. 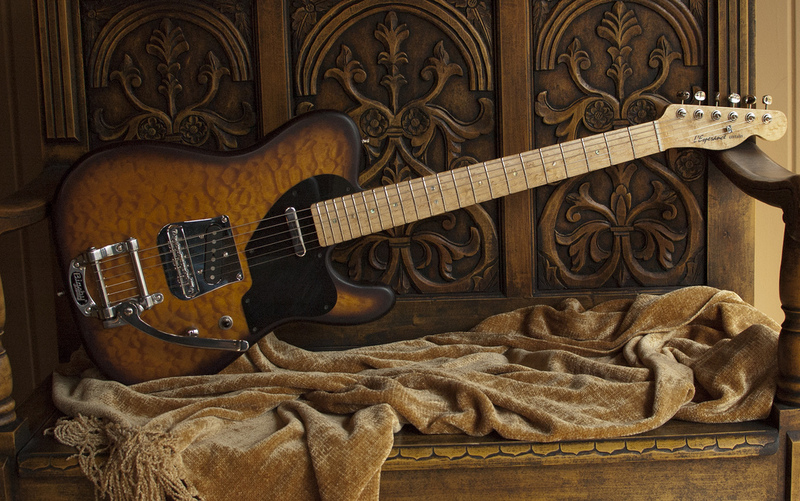 Check out L'Esperance Guitars if you are in the market for a beautiful custom-built guitar. Paul is a great guy and great builder! Bill Callaham really knows tone. 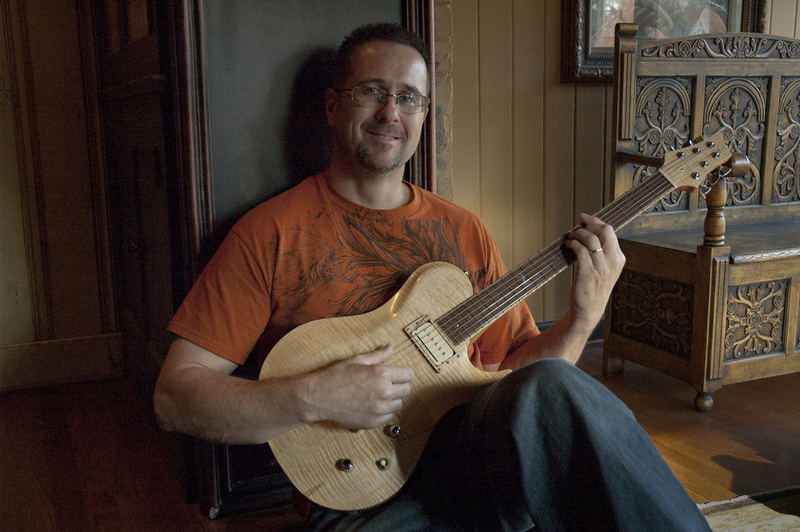 Having grown up with all sorts of great instruments with which to develop his ear (Lloyd Loar mandolins and '50s Gibsons and Fenders), he has built his business on helping others reproduce quality vintage tone. With a strong background in machining, a great ear, meticulous attention to detail and a Mechanical Engineering degree from Virginia Tech, Bill and his company, Callaham Guitars, have introduced an unrivaled level of quality to the vintage guitar repro market. I recently purchased two of his bridges, one a Vintage S Model Strat bridge for my Eric Johnson Stratocaster and the other an ABR-1 bridge with vintage studs, which is a direct replacement for the ABR-1 Tune-o-matic bridge on my '07 VOS Gibson R9 Les Paul. At the time of this writing I have only installed the Vintage S Model on my Eric Johnson Strat, but have not yet installed the ABR-1. 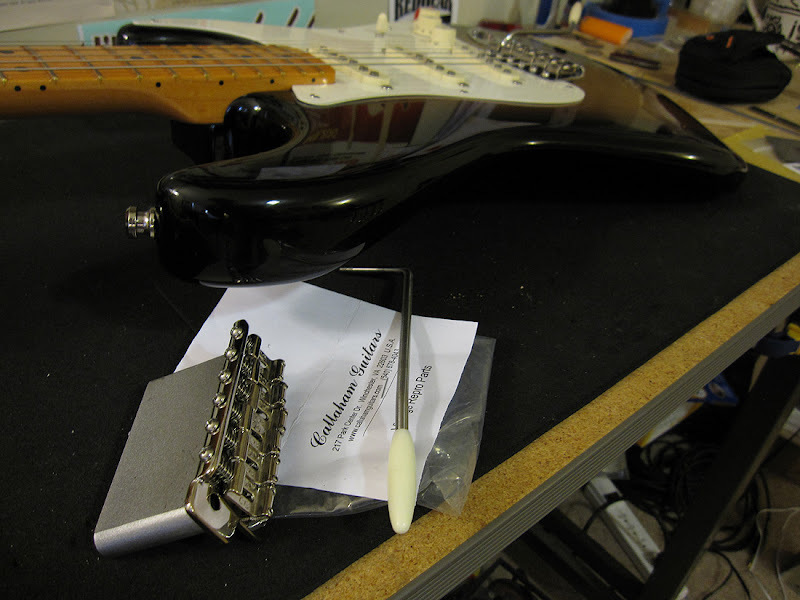 I have also previously purchased and installed a couple of Callaham Limited Production Narrow Strat bridges in two of my other guitars, so this is not my first experience with Bill's product. The first thing you notice when you take one of Bill's bridges out of the box is how much it weighs and the quality of the craftsmanship. These are made from specific steel alloys that Callaham Guitars has found to produce the widest range of frequency response, increase the guitar's sustain and improve note separation when playing chords. 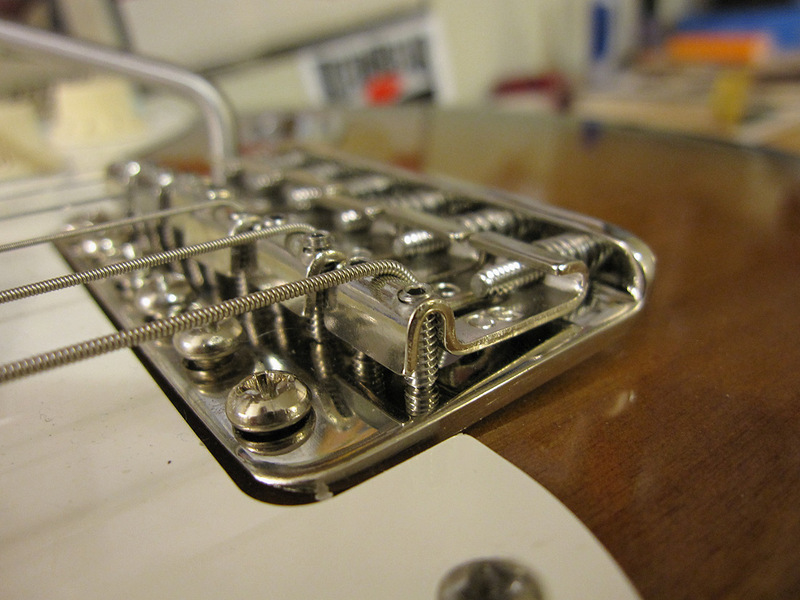 I can attest to the fact that these Strat bridges have greatly improved the tone on all the guitars I have installed them on. Immediately after installation I can hear that the guitar is much louder when strummed acoustically, the tone is crisper and more focused and sustain is greatly improved. 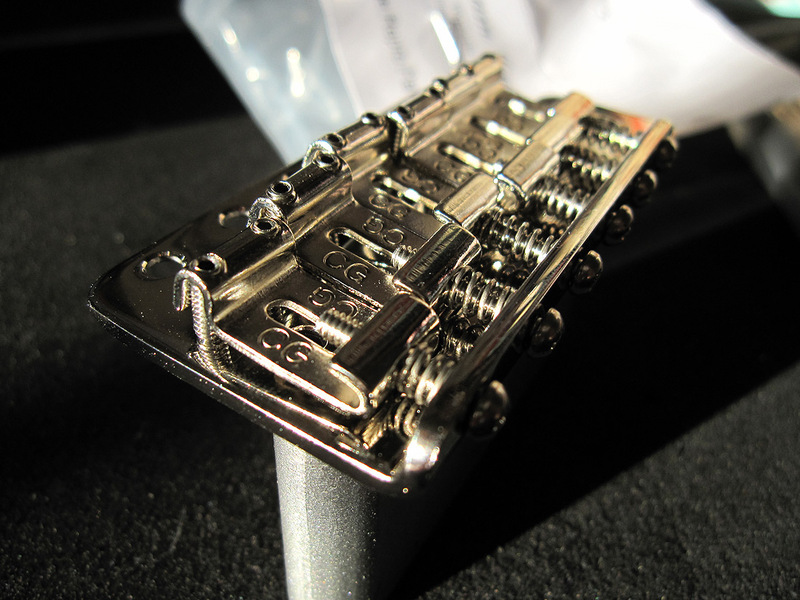 Plus, the superior machining and quality steel alloy makes for a much smoother mechanical action when using the tremolo and tuning stability is never an issue with one of Bill's bridges. I can 't wait to get the ABR-1 on my R9 Les Paul and I will post a follow up once it is done. 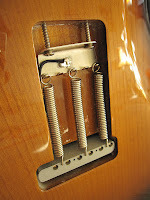 If the Callaham Strat bridges are any indication, then this will be a major upgrade in tone for my Les Paul. 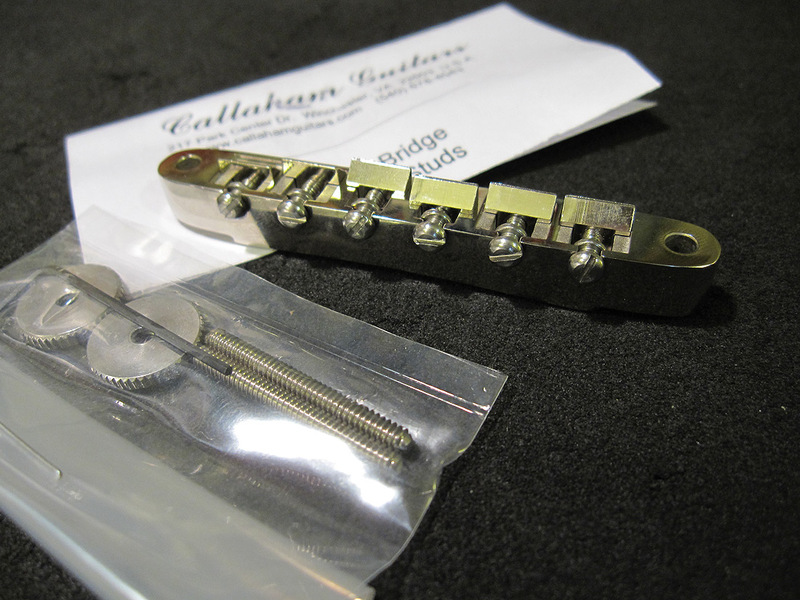 If you are looking for that single mod that takes your guitar from ordinary to extraordinary, I would suggest trying a Callaham bridge first before spending money on anything else. Even though the Eric Johnson Strat has been reviewed to death since its release in 2005, I simply couldn't resist doing another one on my new two-color sunburst. I've only had this guitar for a few weeks and it has quickly become one of my favorites, and if you've ever had a chance to play one you'll know exactly why I love this guitar. Eric Johnson Strats are beautifully built with deep, comfortable contours and a superbly shaped neck that is a real pleasure to play. 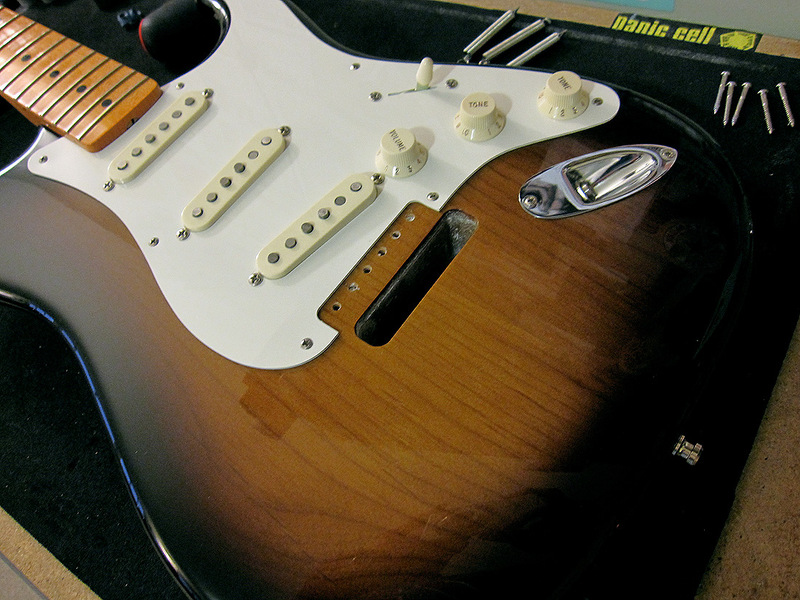 We're talking high-end, Fender Custom Shop quality and attention to detail here for under two grand. You just can't beat that. This is actually my second Eric Johnson Strat. I briefly owned a Candy Apple Red EJ Strat a couple of years ago, but never quite bonded with it. I was acquiring so many guitars during that period that it was difficult to connect with each and every one, so I am glad to have the chance to revisit this great Strat model and spend some quality time with it. The first thing I noticed (as I did with my previous one) was how stiff it played out of the box. Once I put on some fresh Ernie Ball Hybrid strings (.009s on the top and .010s on the bottom), added my treble bleed mod to the electronics, adjusted the truss rod to straighten out the neck, removed a spring, floated the tremolo and readjusted the action and intonation the guitar sounded much, much better and began to play like buttah. With a bit more tweaking (it still needs another truss rod adjustment and some serious playing time), it should break in beautifully and play even better. I really like the sound of this Strat as compared to my others. I tend to pull out the pickups in just about any guitar I acquire and pop in my favorite replacements. 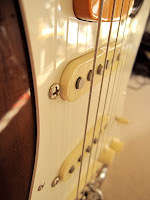 For Stratocasters I typically go with DiMarzio Virtual Vintage Blues singles in the neck and middle position and the Fast Track II single coil sized humbucker in the bridge. This time, however, I am going to leave the EJ Strat electronics completely stock (save for, of course, my beloved treble bleed mod). 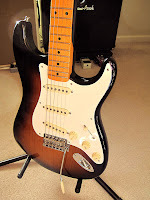 This is my most "Strat-sounding" Strat at the moment and I am loving it! 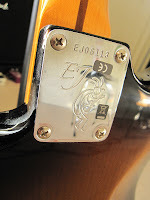 The Fender EJ pickups are a set of great sounding custom wound PUs made to Eric's exact specifications and are a bit lower in output than I am accustomed to. I am compensating for the lower output of the pickups by kicking in a little overdrive boost with my TS808 copy (when needed) and a healthy dose of compression from my Fuchs Royal Plush compressor pedal. Lately I have really enjoyed playing it through the clean channel of my Kingsley D32 amp with generous amounts of reverb, a touch of delay from my Boss DD-3 (a pedal I acquired when I first started playing guitar back in the '80s) and my Fuchs compressor. This guitar just oozes tone through the D32. What a great combo! 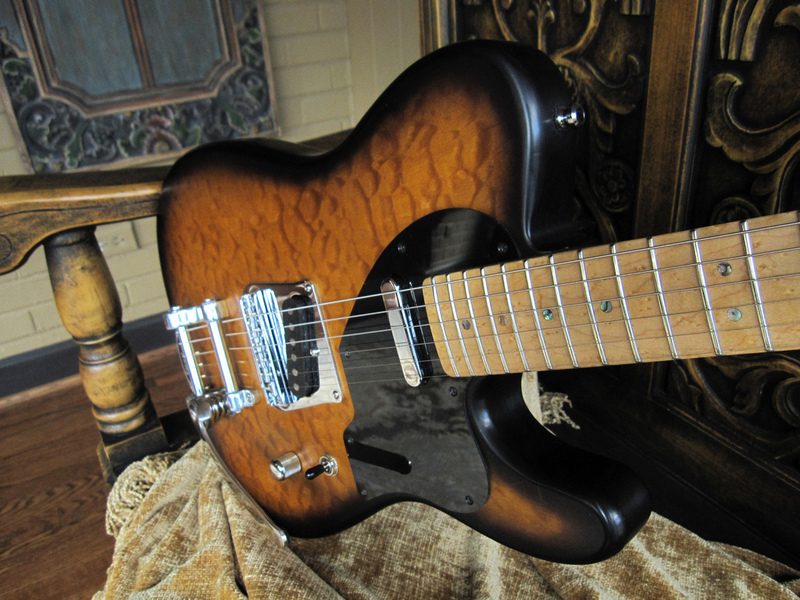 I love guitars finished in "thinskin" nitrocellulose lacquer. Apart from the improvement in tone I like the feel of nitro and the fact that nitrocellulose is a natural, organic lacquer (despite being a very environmentally unfriendly substance). These types of finishes also tend to age beautifully over time. I look forward to the wear marks and battle scars that mine will display in the years to come. 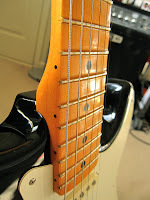 It took several playing sessions before the neck finish "smoothed out" and stopped feeling quite so gummy and sticky. There is a small break-in period for nitro to smooth out and become more glassy to the touch, and I really love the feel of a nitro neck once this curing has taken place. Speaking of necks, the EJ Strat's one-piece, vintage-tinted quartersawn neck is a deliciously chunky, soft V profile with a very comfortably playable and bend-friendly 12" radius fitted with medium jumbo frets-- making fret work super smooth and easy. It puzzles me why Fender doesn't make more guitars with flatter radii like this. A flatter radius makes for a much easier set up and a more comfortable action; plus, the dreaded "fret out" issue is less likely to manifest itself when bending strings in the upper register. One of the really cool, unique features of the EJ Strat is the lack of string trees on the headstock. Some people erroneously believe EJ Strats have slightly angled headstocks, or that the headstock is somehow cut differently in order to make it possible to remove the trees, but this is not the case. Fender actually designed split-shaft, Kluson style tuning machines that are dramatically staggered. "Staggered" tuning machines are simply machines with shafts that get progressively shorter and shorter from low to high, which provides the needed break angle behind the nut slot for proper coupling with string, therefore eliminating the need for the string trees-- even on the B and high E strings. Despite the stock bone nut (a great sounding, but notoriously bad material for tuning stability with tremolos), this guitar stays in tune quite well even with moderate to heavy tremolo use, and the lack of string trees certainly helps. I have a Callaham bridge on order as I write this, and I can't wait to upgrade this guitar with it. 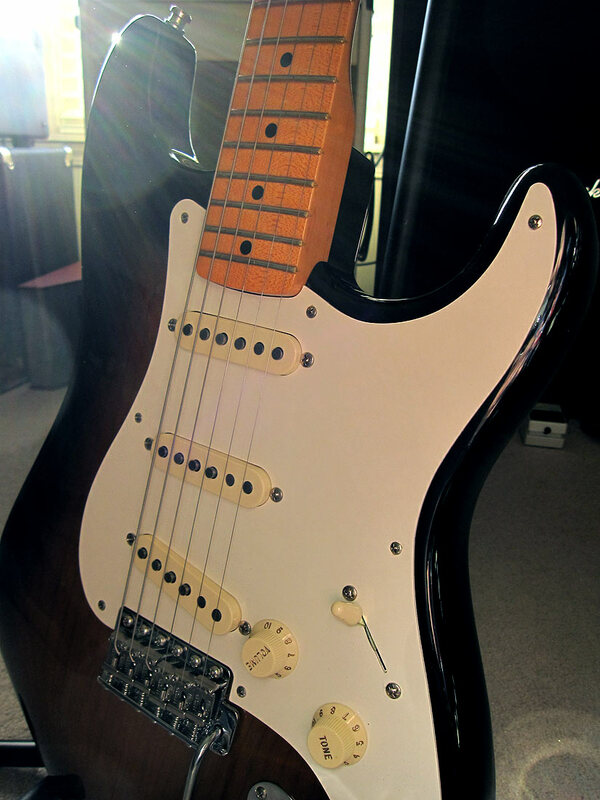 A Callaham bridge is pretty much a mandatory modification for me these days whenever I get a Strat that I know I'll be keeping. 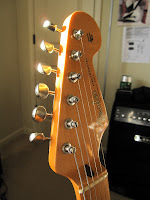 The improvement in tuning stability, tone and feel is incredible and well documented on the Internet. If you've not head of Callaham Guitars, or if you have and are curious, check out the Callaham website. This guy makes the best Fender replacement parts in the business. I'll be sure to post a follow up once I get the tremolo installed. 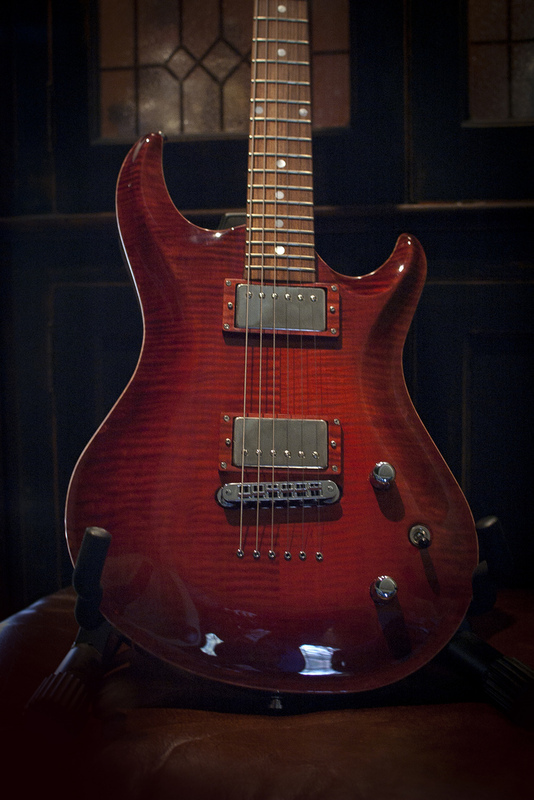 I can safely say that this is one of my all-time favorite guitars in the collection!